Conchita de la Villa – Master in Landscape Architecture Barcelona – Universitat Politècnica de Catalunya – 35ª EDITION. Architect by the Superior Technical School of Architecture of Barcelona in the year 1990. Postgraduate in Energy Management I and II 2015-2016 From 1992 to 2006 he combines work in the Administration with a professional office. In Incasol he manages the unit of Ancient Nuclei. The amount of contribution for the different administrations in this program during those years amounted to 150 works and about 30 Million Euros. As a liberal, he works in urbanization, landscaping and architecture projects. The year 2006 constitutes the company JANSANA, DE LA VILLA, DE PAAUW, ARQUITECTES S.L.P with the architects Imma Jansana and Robert de Paauw. . In 2013 it constitutes the company JANSANA, DE LA VILLA, DE PAAUW, PAISAGISMO, with offices in Sâo Paulo and Teresina in Brazil. She has been a guest project teacher at the School of Floral Art and Design of Gardens of Catalonia in 2016. 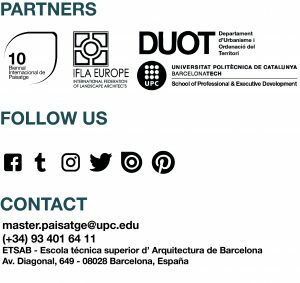 He has given conferences, highlighting the opening of the course of Architecture of the University of Zaragoza in 2018, participation in the Lisbon Architecture Triennial 2013 or the Architecture Biennial and Gardens in 2013. His works have won several awards such as the European Space Prize Urban Public in 2012 or the Construmat Prize in 2009, and they have been published in magazines specialized.